USA defeated GER 107-7 (60-7) to advance to World Championship final. Germany will play for bronze medals on Saturday. German MVP of the game was running back JOAN OSAGIE who scored the first ever score against the US in women’s world championships with a 34 yard run. 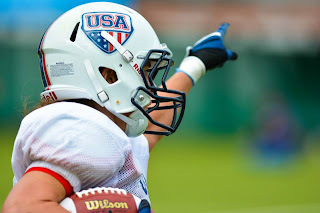 USA MVP was defensive back KATHRINE SOWERS with five interceptions of which two were returned for a touchdown.